Old crumbling hotel It was ok for sleeping but items such as door handles and remote control were sticky. Not a place I’d choose to stay at again. 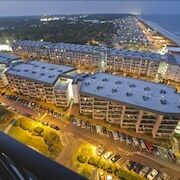 Nestled on the beach, this South Myrtle Beach condo resort is within 3 mi (5 km) of Myrtle Beach State Park and Big Laughs Theatre. Relaxing Vacation Very nice hotel. Ocean view magnificient. Hotel clerk was very pleasant. Housekeeping was adequate. Beautiful spot on beach!!!! 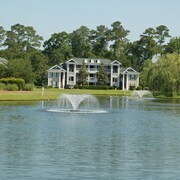 Well kept grounds and hotel.. 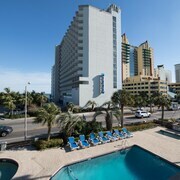 Very nice hotel, we enjoyed our stay there, close to the beach, perfect pools. Definitely we'll go back next vacation. 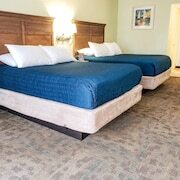 Overall it was ok, with the exception of not having a working phone and no blankets or bedspread on the beds. 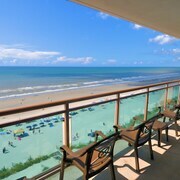 My experience was lovely the hotel offered a great view of the beach and it was close to the attractions I loved every minute of it!!! More than 100 area golf courses have earned this destination the nickname “Golf Capital of the World,” but you may know it more for its wide, reddish-hued beaches and long boardwalk perfect for a sunset stroll. Sugary, melt-in-your-mouth cotton candy and ice-cold soft serve with a chocolate candy dip for lunch? In Myrtle Beach, that’s a perfectly acceptable meal. This seaside town has always been a popular destination for families, with its calm shoreline and classic amusements, but that doesn’t mean the fun ends at sunset. 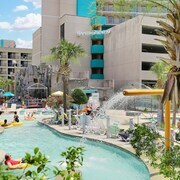 You’ll find live entertainment all over the place—and plenty of Myrtle Beach vacation rentals with cloud-like pillows for you to dream of the next day’s adventures. 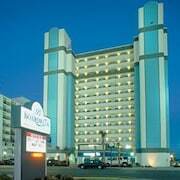 When you awaken in your vacation home in Myrtle Beach, after a quick stretch and a yawn, it’s time to get up and at ’em. There’s lots to do today! 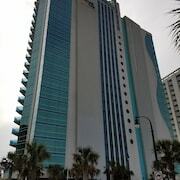 Myrtle Beach is the heart of the Grand Strand, more than 60 miles of beaches that runs from South Carolina’s north coast, so you have lots of opportunities to stake your beach umbrella. Speaking of abundance, sink your teeth into any variety of the freshest seafood around, from flaky crab legs to juicy scallops. Just make sure you have plenty of napkins! 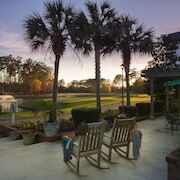 If you’re here for the back nine, there are tons of vacation rentals in Myrtle Beach that will have you yelling “Fore!” Barefoot Resort by Palmetto Vacation Rentals is located right on the grounds of a golf club, for minimal effort and maximum golfing. 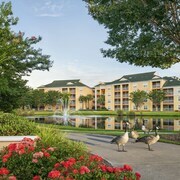 Convenient accommodation will help you maximize your golf time, and Travelocity will help you maximize your dollar-to-fun ratio. 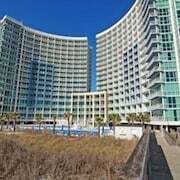 You may have heard of our awesome hotels near Myrtle Beach, but vacation rentals offer a whole new world. 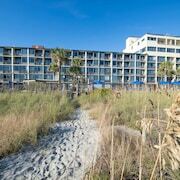 Whether you want a sky-high condo or a cottage so close to the beach, you’ll get salt in your hair, we’ve got it. 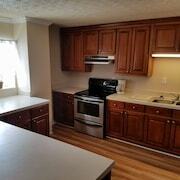 Find your perfect rental today and you could be here tomorrow!